These are products from the First Texas Company which also owns Teknetics and Fisher products. It is an American-based and run corporation. 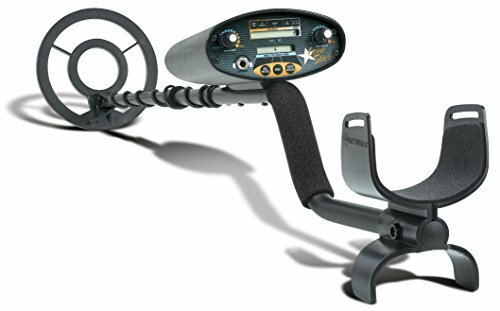 Bounty hunter devices have been sold since 1988 as affordable, easy-to-use top-quality products. They make metal detectors and accessories. This stylish device is suitable for sweeps in the beach, at the park or in your own backyard. It is a bounty Hunter which is arguably the best at making MDs therefore implying that it is a good product. It can be used to detect coin-sized objects as deep as 6” and larger ones to 2’. This is no mean thing when the device is put up against other similar devices on the price range or level. It has an 8” closed concentric search coil that can be submerged in shallow waters such as in beaches. This is probably what gives it the strength because the rule of the thumb is that the bigger the radius of the search coil the greater the strength of the detection and depth achieved. 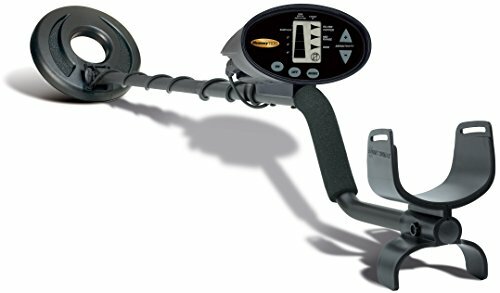 It has automatic tuning and ground balance to adjust the device to any soils mineral content. This is useful for any particular detection as it finds for metals that are useful and adjusts to the soil rather than giving false alarms when the soil gets a bit concentrated with minerals. It also has a treasure meter and its sensitivity levels can be adjusted by use of knobs on the control box. There is a trash eliminator for discrimination against unwanted metals by the virtue of signal strength. The discriminator dial will have to be set manually for persons who are a bit experienced and mind the noises. Others will just get along with it as it is. A motion all-metal mode functionality is at play when sweeping so that the user can tell the concentration of metals in a particular area before zeroing in on a particular zone. It comes with headphones and a 1/8 headphone jack which is a good thing because you have the option of privacy when searching for your coins. It uses two 9V alkaline batteries which are not included in the purchase. 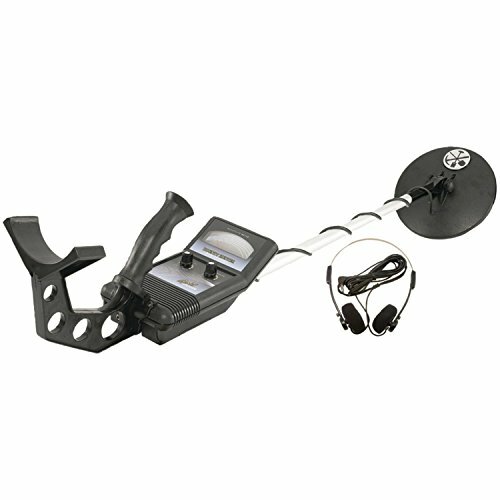 The product is well-packaged and therefore easy to set up and use. In fact, its packaging is certified and frustration-free. The drawback with this device is the lacking display which would prove rather useful in hunting as it would identify targets easily and their strengths. It is still ideal for children though as they will not have enough time to look into such detail. 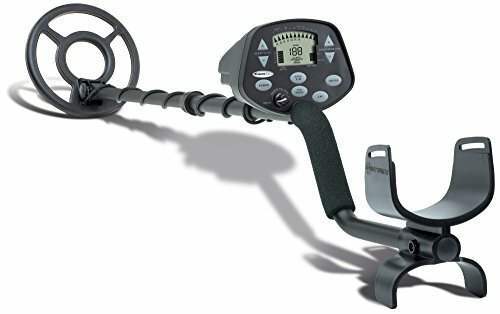 It is suitable for beginners and teenagers who do not mind the missing display screen or are not too keen in metal detecting to feel the difference it is thus an entry level device. It can also be useful for locating missing wedding bands perhaps so well that it got coined the gold digger name. It costs $55 on amazon.com which makes it a pocket-friendly device. Weighing about 3.5lbs, this submersible product is easy to set up and use. A major drawback as described, is the lacking display screen which many users agree that helps to avoid unnecessary digging up of trash. It has a one year warranty which is a plus as it is on service and the product. It comes having a five-year warranty on goods and service implying that the guys at Bounty Hunter can take a big one for it. The device has a solid finish giving it a rugged look and feel for its use in harsh soil conditions such as those with high mineral content. It is built for tough circumstances and is therefore equally tough, rough and durable. It has preset ground balance that neutralizes in response to the minerals in the ground thereby allowing it to only go off when metals are detected and not minerals deposited in the ground. It has disc or notch control for discrimination of metals by virtue of their signal strength. With this device, sensitivity can be adjusted to reduce electromagnetic interference. This is kind of like the way radios work when tuning stations. It has an 8-inch concentric coil that can be submersed in shallow waters and damp grass or at the beach side with a bit of sand and salty water. It can search up to 8” deep for coins and similar-sized objects and 3’ for larger objects. This is fairly okay when pitched up against other devices of a similar range. It functions on three operation modes. The motion all-metal mode functions to sweep over an area and give feedback on the concentration of metals in an area. Once the search coil stabilizes, the metals are discriminated against to only give favorable signals a beep. The discrimination mode eliminates unwanted metals. Tracker mode uses two-different tones to distinguish between different metals. My guess is as good as yours, this could be the fourth generation tracker hence termed the Tracker IV, eey? It has a 1/8 inch headphone jack for private hunting and for use in noisy areas such as parks. This is a standard size jack that fits most headphones available in shops and online. It requires two 9V alkaline batteries to start up and this, along with the headphones, are not included in the purchase. It also has target identification on a meter which displays the signal strength oscillating from left to right upon detecting increasing strength in signals. It also has a low-battery indicator for convenience of the user. No one would want to discover that there is no battery left only after 2 minutes of hunting anyway. At 3.7lbs, it is very light thereby allowing ease of use and prolonged service without tiring its user. Its ergonomics also have the user’s comfort in mind and allow for easy handling. Its shaft length can be adjusted and it has a padded arm rest. It also has a detector stand which keeps your device out of the mud while you are retrieving the target. It is part of the discovery series of Bounty hunter devices which are pitched as affordable and super user-friendly with easy to use controls. The 2.5lbs device is pretty neat for the price. The super lightweight is especially good for working many hours on end without getting tired or hurt. It is great for finding coins, metals and relics at the beach, or at one’s own backyard as a hobby or interest or full-on job. The device has full-digital motion discrimination for the elimination of undesired metals based on the strength of their magnetic tug and the depth at which they are located. One can simply key in the target strength in search of and leave out the rest as trash. This is made possible by the discrimination button on the control box. The detector also has 3-tone audio target identification. This is good for identifying what metal you have likely found as opposed to the monotonous beeps of single tone identification. The three tones can also distinguish the strength of the target in question. There are 4-segment depth and 3-segment target indicators on the jumbo-sized Liquid Crystal Display (LCD) display on the control box. This display makes it easier to identify targets and evaluate the statistics of sensitivity and discrimination. It is especially easy to read and simple to use. The buttons also allow one touch depth control. There is a touch pad digital control as well to ease functionality of the device. Automatic ground balancing is another feature that does not disappoint. The device is able to evaluate the soil characteristics too and especially the content of minerals in the ground and determine the metals of value from trash. It also allows the device to reduce electro-magnetic interference from the environment as it is sweeping. A 7” waterproof interchangeable coil is used by the device which is able to ping coin-sized objects up to 6” deep and larger objects 2 feet deep. It bears an adjustable aluminum stem which makes it useful for people of various heights as well as altering it for different use. The aluminum makes the shaft lightweight so you won’t tire so quickly. It also makes it sturdy to give support to the control box which is as arms-length or thereabout. It also has a padded arm rest which enhances comfort during use and a comfortable arm grip for long hours of use. Enthusiasts and hobbyists would really love such specifications as they tend to make their time easy. It is truly designed with user in mind. Aside from these, the device is certified frustration-free by means of its packaging. This means that it is easy to set up and even easier to use. Anyone can have one, even a beginner or a teenager. This is another one from the discovery series just like the previous device. It is enlisted on amazon.com at $206 so one can tell it is an upgrade or newer model of the 1100. The gadget weighs 2.6lbs so it is not heavy at all. This makes it fun to use for ages without the fear of tiring your arm or having trouble lifting it back to the house or taking it out to the yard. Speaking of the yard, the device can be used comfortably in the backyard or the beach. It can also be used at a park for coin shooting, searching for lost coins, property or house items and hunting treasure. The device has a digital LCD display on the control box with advanced user-friendly features to ease your use of the gadget. The 3300s display shows 11 segments of digital target identification to help you find it accurately and precisely. It has a preset ground balance that neutralizes the mineral content on the ground. This makes it possible for it to determine what iron is from what is not iron and that is, what you are searching for. It also has a zap button which when tapped, eliminates trash from treasure. It has sensitivity controls too, which assist your hunt by reducing or eliminating electromagnetic interference. It has 4 different tones for audio feedback which guide you to pinpoint the exact find. It also has a digital probable coin-depth indicator. This one determines how deep a target is buried and makes it easier to dig it up given the precision. The design of the 3300 is made for easy handling. Apart from the lightweight nature, its ergonomics are geared toward the same. It is super comfortable to use just like the 1100. It equally has a detector stand for placing the detector safely away from mud when digging up the target. It also has a padded arm rest for comfortable sweeping and shouldering of the control box’s weight. It bears an adjustable height design for the user’s comfort and height allowance as not all users are the same height anyway. It is designed with an 8” open coil with waterproof capability for sweeps even to the beach and swamps. The coil and stem are both waterproof. The depth that can be reached is 8” for coin-sized items and 3 feet for larger ones. It works on two 9V alkaline batteries which won’t be in package. It boasts of four operator modes controlled by an intuitive touchpad. They are: motion all-metal mode, progressive discrimination mode, notch mode and pinpoint mode. The motion all-metal mode determines where the target is by showing you the area you should concentrate on. The progressive discrimination mode uses one tone to automatically eliminate iron and other unwanted metals. The notch mode, on the other hand, can manually eliminate those unwanted items or notch them out. The pinpoint mode searches how deep the targets are when the search coil is still in one location. The detector comes with a ¼ inch headphone jack for persons who opt to hunt privately. It has a five year warranty on goods and service which makes this product a good purchase. It is an intermediate device with advanced technology for enthusiasts and hobbyists. It can be used for coin shooting, relic hunting and general purpose detecting. It can be used at home, at the backyard or even in a park. It can also serve persons looking for a hobby that can generate some cash hopefully from the finds at detecting. It has an easy to read and use LCD display on the control box too. This is geared toward easing the task of target identification. The LCD provides 5 segment digital target identification for improved accuracy and precision in identifying a target. It has an in-built speaker that speaks out the location of targets in tones any ear can learn to understand. A low tone on this device indicates nails, bottle caps, gold and/or nickel. A medium tone shows pull-tabs, pennies from after 1982 and zinc whereas a high one implies silver, brass and pennies from before 1982. It also has a headphone jack for those days when you just want to hunt privately or when you find your environment a bit noisy and require to concentrate. Users especially find this device good on finding silver and nickel. 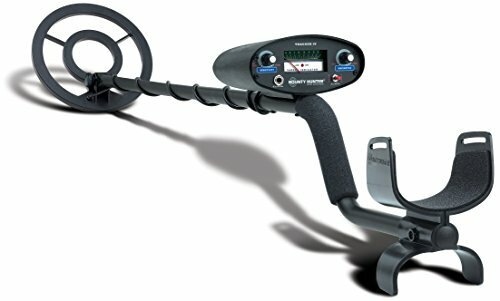 It has an 8” concentric search coil which when leveled out well, even on water, can detect coin-sized items up to 8 inches deep and larger objects as deep as 3 feet. The coil is interchangeable if you wish to upgrade to a wider one for enhanced detection. It is also waterproof providing more options of hunting locations to include the beach, ponds that are shallow and marshy areas that are not so deep. It functions on three modes: all-metal mode, discriminate notch and auto-notch. The all metal mode is useful for indiscriminate prospecting also known as every metal can be detected when it is in motion. As stated earlier, this is useful in determining where to zero-in on. The button for this is on the touch pad. Automatic disc/notch eliminates all unwanted metals whereas the discriminate notch allows the user to determine which ones to actually discriminate. It has an adjustable aluminum stem which is sturdy enough to hold the weight of the control box but light enough to be able to be carried around whilst sweeping. The handle is s-shaped to increase convenience and comfort. The armrest is padded for extra comfort too. It weighs only 4.6 pounds. The device has a 5 year warranty on parts and service which is pretty awesome and an unmatched guarantee that only bounty hunter can provide. It requires two 9V alkaline batteries and like all other Bounty Hunters, you will have to purchase separately. As if all these features are not enough, the shipping is packaged in a certified frustration-free manner which implies that there is no hassle in setting it up and using it.